EUREKA, MO. 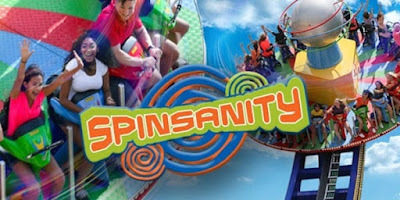 -- In 2017, Six Flags St. Louis will debut a brand new spinning ride. Spinsanity will be the first of its kind at the park, featuring a giant rotating disc that sways back and forth simultaneously. You'll board the giant round disc seated in outward-facing motorcycle-style seats so you can watch the world blur by. The disc will rotate counterclockwise at 14 revolutions per minute. While spinning, you'll also be tilting side-to-side along a five-story half-pipe track. With a unique design, The ride will deliver a dizzying rush and unpredictable twists every ride and will open Spring 2017.